Paul Hendrie nets the winner in Halifax's win over Man City. Picture courtesy of Johnny Meynell. But two of The Shaymen’s most memorable days ever should serve as inspiration to the current crop ahead of their FA Cup second round clash at home to League One AFC Wimbledon on Saturday. Town keeper John Kilner makes one of numerous saves in Halifax's win over Man City. Picture courtesy of Johnny Meynell. Tom Scargill talks to some of those involved when Halifax upset the odds and knocked Manchester City out of the FA Cup in 1980. The build-up to Halifax’s win over Manchester City is almost as intriguing as the game itself. City manager Malcolm Allison had hired a hypnotist by the name of Romark in the run-up to Crystal Palace’s 1976 FA Cup semi-final against Southampton, but had refused to pay for is services, so the hypnotist then put a curse on Allison’s side. Who lost. 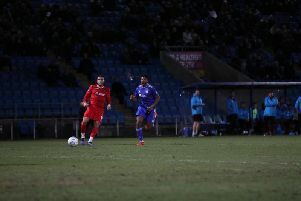 Joe Corrigan concedes a corner under pressure in Town's win over Man City. Picture courtesy of Johnny Meynell. Four years later, he came back to haunt Allison. “In the week coming up to the game, the manager George Kirby had gotten hold of this hypnotist, and brought him into the training ground,” explains match winner Paul Hendrie. “He got us into a room one-by-one, and tried to hypnotise us. “He had this jinx on Malcom Allison apparently. “I’ll always remember him saying to me ‘shut your eyes’. He said ‘what’s the score going to be?’, and I said ‘one-nil’. “He went ‘who to?’, and I went ‘Halifax’. I said to him, joking away, ‘and I’m going to score the goal’. “He said we were going to win, and that he thought it would be 1-0,” says Dave Evans. Manager George Kirby celebrates Town's win over Man City. Picture courtesy of Johnny Meynell. “We thought it was a load of rubbish. “He put Mick Kennedy between two chairs to see if he could keep himself up. “He couldn’t do it, but then he hypnotised him and he did. Manchester City had finished 15th in the First Division the season before, and Allison brought an expensively-assembled squad to The Shay, including £1.45m man Steve Daley. “We were excited about the game, testing ourselves against better players,” says Evans. Match-winner Paul Hendrie celebrates Town's win against Manchester City in 1980. “The game didn’t look like it was going to go ahead two or three days before, with the snow and everything, but supporters rallied round. “The ground was a big leveller,” says Hendrie. “I remember going to the ground, and everybody thought it was going to be off. “We wanted it on, because those pitches are levellers. “They’d just signed Steve Daley from Wolves for a lot of money, they were a great footballing team. “And a big muddy pitch was always going to be a leveller to stop their fast-flowing football. “There were loads of fans at the ground with forks trying to drain it away. They even had towels to dry the mud up. “I think the pitch was quite a leveller,” agrees Evans. “When you look at their team, Steve Daley was one of the first million pound players, they had Tommy Caton, stars really. “We were a bunch of journeyman, a mix of some experienced players and some kids coming through. “The pitch stopped them doing their quick passing game and allowed us to get closer to them. “The thing we had was a great team spirit in the squad,” says Hendrie. “The pressure wasn’t on us, the pressure was on Man City to get the result. And they did, thanks to Hendrie’s gloriously improbable winner 15 minutes from time. “I remember Micky Kennedy taking a throw-in on the left-hand side up the line to a lad called Andy Stafford,” recalls Hendrie. A quarter of an hour later, delirium. “And the dressing room was chaos, we were all covered in mud and I’m getting pictures taken drinking champagne out of the muddy boots. “I remember Paul drinking champagne out of his muddy boot,” says Evans. “There are two big highlights for me in my career,” reflects Hendrie. “One was when played in America, and I man-marked Pele. I’ve got pictures of that. “I was only 21 at the time. I followed him all over the pitch. The picture I’ve got is me going up to head the ball with him. “I caught him in the face with my arm, and he had a bust nose and had to go off for treatment. “He came back onto the pitch, and I went to man-mark him again, he shook his finger at me and went ‘don’t do that again’. “And the Halifax game is the other. They were the two biggest things in my career. “It was massive. I think it was bigger than Hereford beating Newcastle, because of the squad they had. “Joe Corrigan was their goalkeeper, they’d just signed a lad from Liverpool, Michael Robinson, the squad they had was unbelievable. Halifax Town: Kilner, Dunleavy, Hutt, Evans, Harris, Hendrie, Firth, Kennedy, Mountford, Smith, Stafford. Town players celebrate their 1-0 FA Cup win over Man City. Picture courtesy of Johnny Meynell.